Potatoes are one of the easiest vegetables to grow, although they do take some patience as they develop underground and out of sight. But you've probably never seen a packet of potato seeds for sale. Although potatoes do set seed, they are not grown that way because they do not grow true to seed. To get the variety of potato you want, you will need to grow them vegetatively, meaning you re-plant a part of the actual potato. These pieces of potato are referred to as seed potatoes, which can be a bit confusing because they are not seeds at all. While you could plant any potatoes and have them grow into plants, it is not recommended that you try growing potatoes from the grocery store for two reasons. First, grocery produce is often treated with a growth inhibitor. This is meant to keep the produce fresh longer, by preventing it from sprouting. Even when planted in the garden, your grocery potatoes may never take root. Organically grown potatoes are probably free of growth inhibitors, but they still don't make the best choices for seed potatoes. Because potatoes are propagated vegetatively, any diseases from the prior year will be carried over in those small pieces of potato. That's why it is so important to use disease-free seed potatoes. That means buying certified seed potatoes, rather than supermarket potatoes. Certified seed potatoes are certified by a government authority to be disease-free. However, even certified potatoes can contract disease once planted, especially diseases that are not apparent in the seed stage like ring rot or fusarium wilt. Still, at least you have a bit of an edge, with some disease tolerance. Start with the healthiest, strongest seed potatoes to avoid problems and guarantee a good harvest. 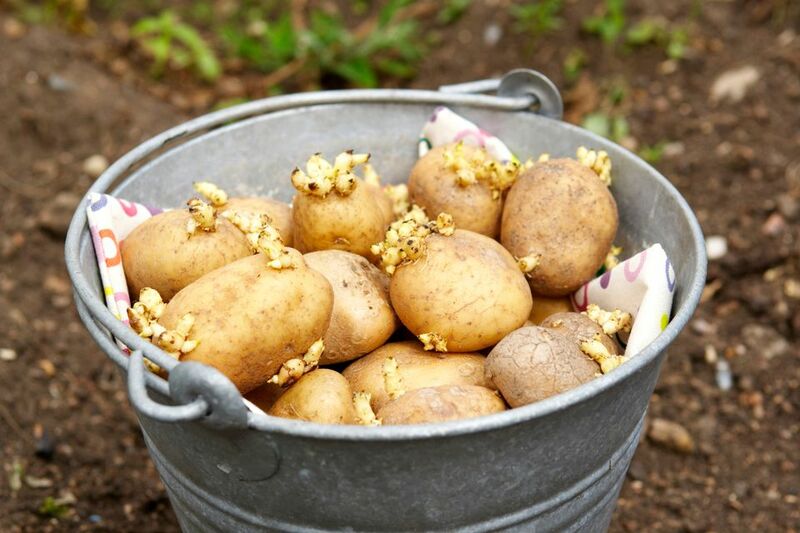 Any potatoes that have a soft spot, cracks or bruises or signs of rotting should be discarded. What Exactly Do You Plant? You do not need to plant a whole, intact potato. Seed potatoes can be cut into pieces, as long as the pieces have at least one eye each. An "eye" is a bud that grows into a new plant. If you've ever kept your potatoes in the cabinet too long, you've probably seen them sprout. More eyes per piece equals more, but smaller potatoes. One or two eyes per piece means fewer potatoes, but they will be larger. If you decide you want to cut your seed potatoes into pieces, cut them about two days before you plan to plant. This allows the pieces to callus or seal which prevents rotting and provides a barrier from soil-borne diseases while the pieces sprout and take root. To further protect your seed potatoes, you can dust them with powdered sulfur right after cutting them. Place the potatoes in a bag, add the sulfur and shake. Then lay the pieces out and let them dry for three to four days. If your seed potatoes are already sprouting. If you have an early-maturing variety and want an early harvest. If you choose to chit your potatoes, do so before you cut them into pieces. Although potatoes will sprout in the dark, you will get long, pale shoots that easily break. Instead, place them in a cool spot (winter room temperature)with bright light. This way, the sprouts will grow stocky, sturdy and dark green. A traditional method for chitting is to place your seed potatoes upright in an egg carton, with the bud end facing up, but you can just lay them out on a tray or screen, as long as they are not piled one on top of another. It will take about two to four weeks for the chits to develop, so don't start until about one month before your outdoor planting date. Potatoes will store for several months without sprouting if kept dark and at about 40 F/4 C.
You can plant your potatoes as soon as the sprouts on the potatoes are 1/2 inch to 1 inch long. If you have to postpone planting because of weather or some other reason, move them to a cooler spot, to slow down their growth. Don't want too long, or your seed potatoes will dehydrate and begin to shrivel. Handle the seed potatoes carefully, so the sprouts do not break off or become damaged. You can plant the whole potato or cut into pieces with at least one eye each, but do this after chitting, not before. Plant with the sprouts facing up and cover lightly with soil. How Much Should You Plan on Planting? On average, one pound of seed potatoes should yield about 10 pounds of potatoes. One pound is about 5 to 8 tubers, which should be enough to plant about a 10-foot row.